Standard hose clamps have stainless steel band and are suited to multi-purpose applications. Stainless steel clamps are suitable for corrosive environments. Shielded clamps are designed for soft hose materials. Inner stainless steel band prevents material from protruding through slots of outer band. 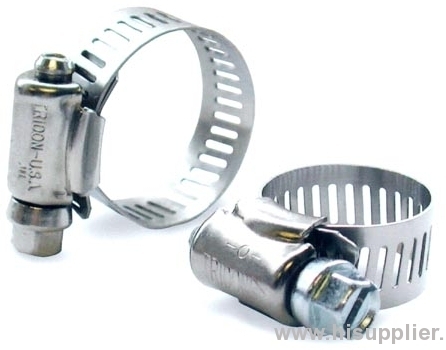 Fuel Injection clamps have non-perforated band and zinc-plated carbon screw and nut. Locking hose clamps can be closed by hand and have temperature range of 40 to 185 deg F.